The second stop on our tour was the Fish River Canyon. It is the second largest canyon in the world, topped only by the Grand Canyon in the United States. Most of the area is a large nature reserve, with lodges and campsites scattered across the wide landscape. 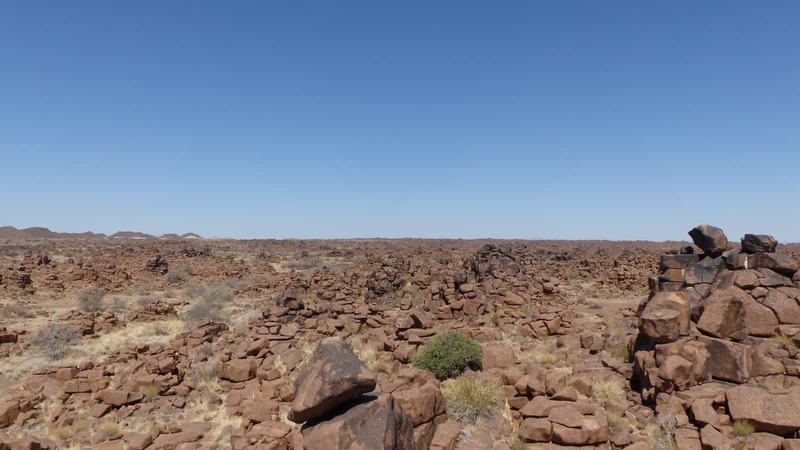 If you get a permit beforehand – and bring enough time and stamina – you can hike the Fish River Canyon from the viewpoint (near Hobas Camp) to Ai Ais on a spectacular 5-day guided hiking trip. Only 50 people are allowed in the canyon at once, so you have to apply early enough. All others are strictly forbidden to enter the canyon (at least from the North), though you can hike a small part of the trail from Ai-Ais. We didn’t have enough time for the entire hike, but at least we got a glimpse on a short tour from Ai-Ais. The route to the Fish River Canyon from the Kalahari was one of the longest drives on our trip. The first part was relatively dull (compared to the other roads we drove); it was just several hundred kilometers of straight tar road through the desert. 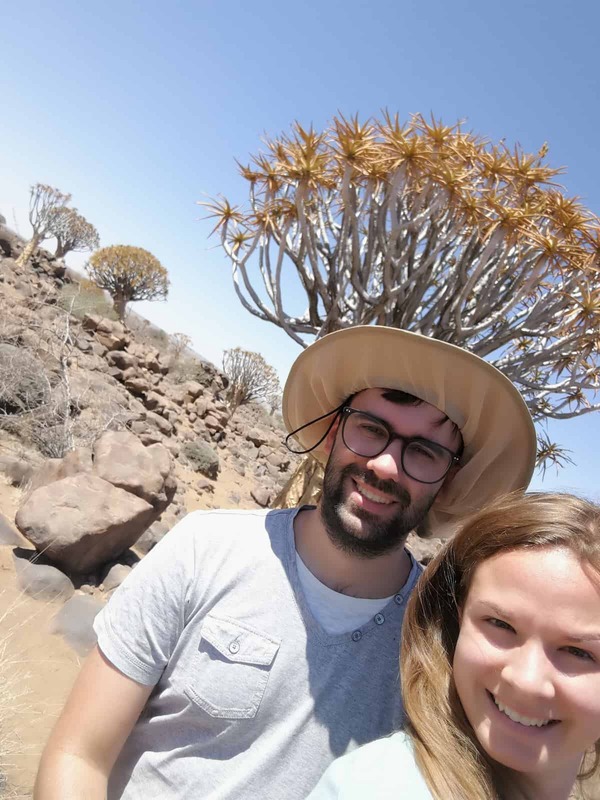 To spice it up a little bit, we planned two stops on the way: The Hardap Dam near Mariental and the Quivertree Forest near Keetmanshoop. In retrospective, we should have left out the Hardap Dam. After driving 5km on a gravel road, we reached the entry to the dam, but everything was enclosed in fences, and it didn’t look like we were allowed to pass the gates. So we turned around without having seen the water (or any of the white rhinos that roam the northern area of the dam lake). At least we already got to cross the Fish River, which we were to meet again several hundred kilometers later at the canyon. A weaver bird approaching its nest in a quiver tree. 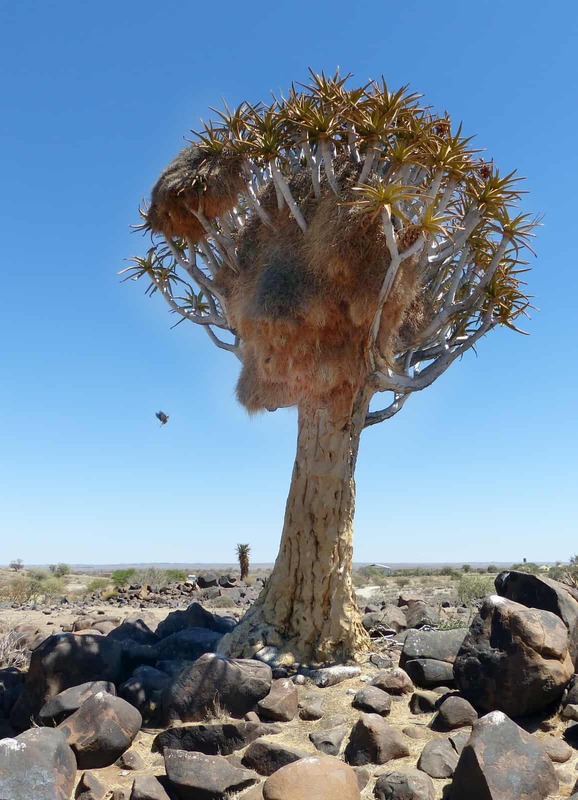 The Quivertree Forest is located 10km north of Keetmanshoop. Quivertrees are actually Aloe plants that grow to a size of 2-3 meters. The San used to hollow out the branches to make quivers, hence the name. Some of the trees are completely capsuled by the nests of Weaver Birds. 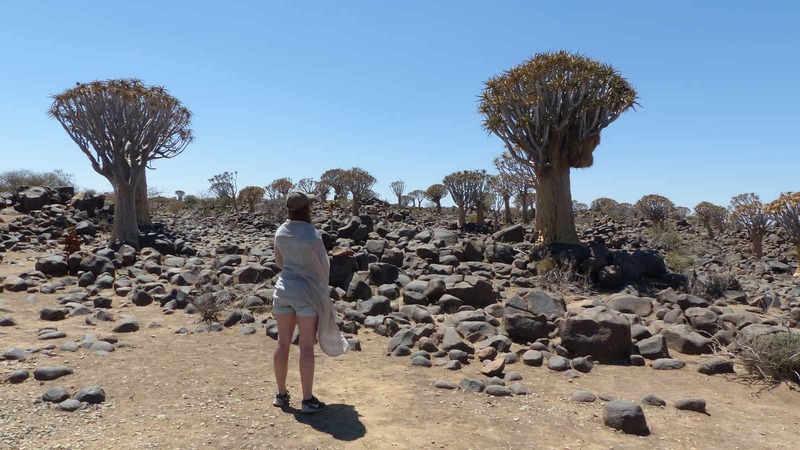 Entry to the forest is N$ 60 per person and also covers the nearby Giant’s Playground, where you can follow a 60-minutes hiking trail through a bizarre volcanic rock landscape. It’s an okay’ish stop on a long route, but not necessarily a “must-see”. We restocked with gas and supplies in Keetmanshoop and continued towards the Fish River Canyon. After leaving the B4 on the C12 near Naute Dam, the road turned into a (well-prepared) gravel road. 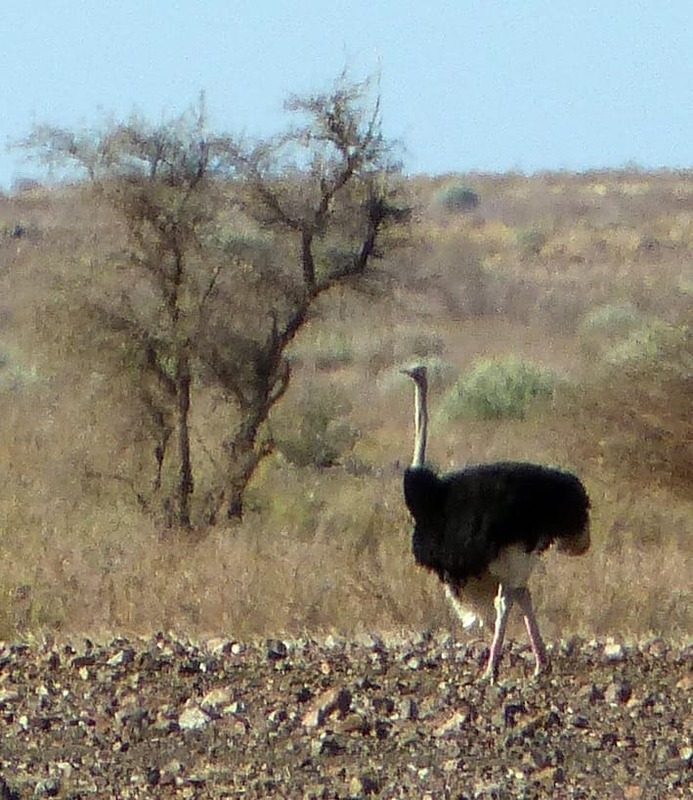 On the last 20 kilometers before Hobas Camp, we spotted numerous antelopes, and two large flocks of ostriches. Yeah! Our first “real” animal sightings. Hobas Camp itself is a large campsite run by Namibia Wildlife Resorts (NWR). All facilities were well-maintained, staff was friendly, there was a pool and a restaurant, and even free wi-fi. We set camp below a large acacia tree and finished our day with a nice Braai (barbeque). 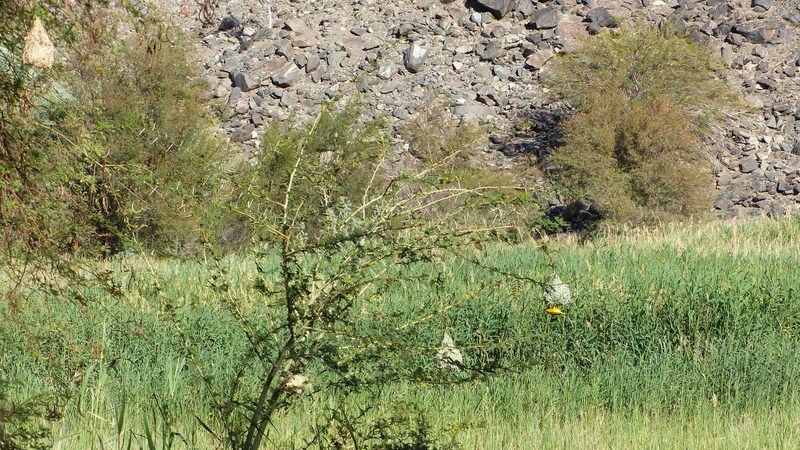 If you stay at Hobas, be careful not to leave any food in your tent or outside, because the place is ransacked by scarily huge baboons in the morning. Thankfully, any of our movements was also closely watched by cheeky birds that loudly argued over our breadcrumbs. 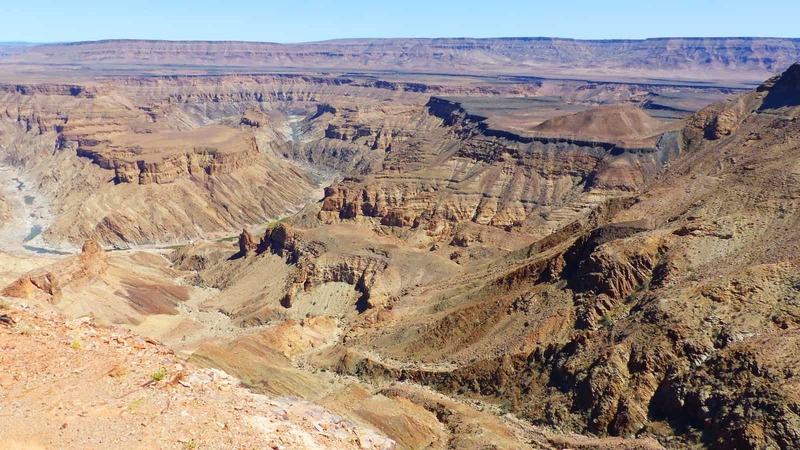 From Hobas Camp, it’s just a short drive to the Fish River Canyon viewpoints. There scenery indeed is impressive, and even if you’re not allowed to hike within the canyon, you can do a 30 minutes round-walk on the edge of the cliff from the “Fish River Canyon Viewpoint” to the “Hiker’s Viewpoint”. The drive from Hobas to Ai-Ais through the amazing mountain desert is breathtaking. We didn’t spot much wildlife (except of a super cool rock monitor and a single oryx antelope), but the scenery more than made up for it. Ai-Ais is another NWR lodge & campsite. All camp stations have water, electricity, and a grill. Facilities are in pristine condition, and there’s even a gas station on the camp ground. Wi-fi is not available anywhere on the area. Ai-Ais marks the end of the Fish River Canyon. On the campsite premises, 65°C hot springs feed an outdoor pool and an indoor spa. According to the legend, a local shepherd’s boy found the hot springs by chance, and aptly named them “Ai-Ais” – which translates to “very hot”. At the end of the campsite, we entered the Fish River Canyon hiking trail. 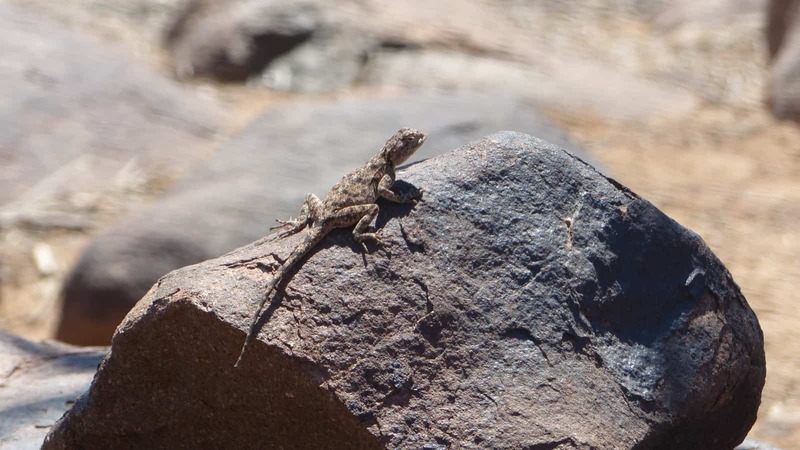 The canyon is full of wildlife. 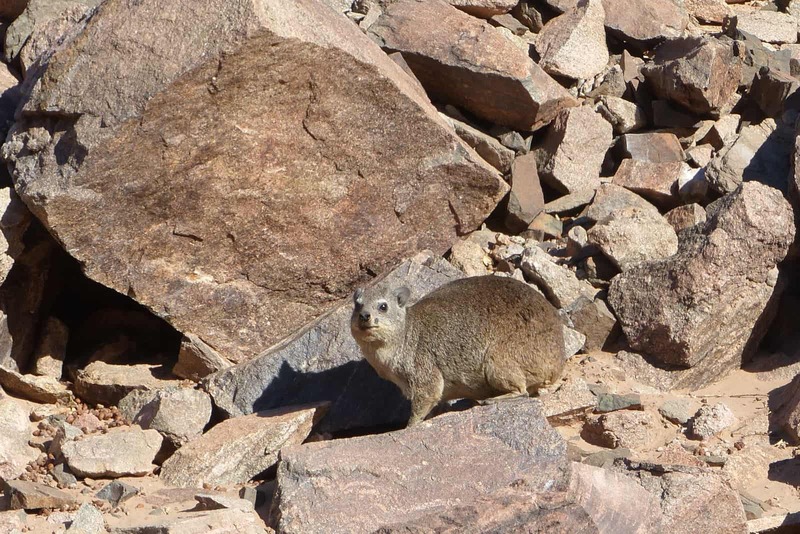 We were welcomed by the whistles of rock hyraxes (a sort of marmot) which inhibit the steep cliffs of the canyon in large numbers. 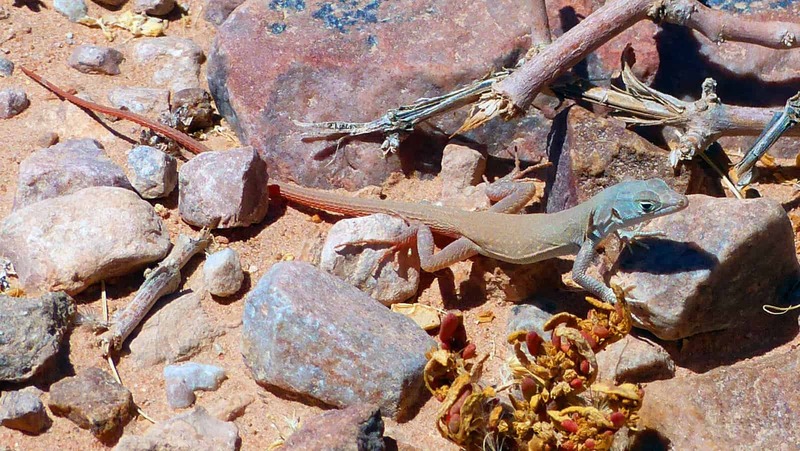 Even though we didn’t spot any larger animals, we saw lots of birds, lizards, and insects of all size. We hiked about 45 minutes into the canyon, then returned and treated us with a Braai and a bath in the hot springs swimming pool.